Listen to more of his music here. Cluck Old Bull liner notes. 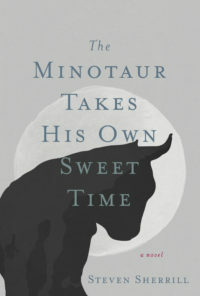 Tickled pink to announce that my novel, The Minotaur Takes His Own Sweet Time, was accepted by John F. Blair Publisher, for release in the fall of 2016. These are the folks who did such a lovely job with my first Minotaur. It feels like returning to some ancestral home. More details and silliness to follow as things develop. Peace & Banjos. The Minotaur rears his sonic noggin.